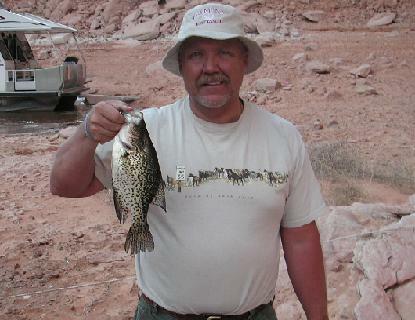 Black Crappie caught at Lake Powell. The black crappie, Pomoxis nigromaculatus, is a popular sport fish that is currently found in many of Utah's warmer waters. The species is not native to Utah, but rather to much of central and eastern North America. The black crappie is much more abundant in Utah than is the closely related white crappie. The two species can be distinguished by several characteristics, including dorsal fin position; the dorsal fin of the black crappie is closer to the head, whereas the dorsal fin of the white crappie is further back on the body. Adult black crappie eat small fishes and many types of invertebrates, including zooplankton and insects. The diet of juvenile black crappie is composed primarily of zooplankton. The species spawns in the spring and early summer over nests dug by the male in the substrate. After spawning, males guard the eggs, which hatch in two to five days. The black crappie prefers slow-moving, clear areas of warm creeks, streams, lakes, and reservoirs. The black crappie has two closely joined dorsal fins. Black crappie are silver-olive with numerous black or green splotches on the sides. Vertical bars, prominent in the young, are absent in adults. Sides are light, iridescent green to silvery. Belly is silvery to white. Pelvic fins are opaque with some black on the tips of the membranes, and pectoral fins are dusky and transparent. It is fairly abundant	in Utah lowland warm waters from Cache Valley to Lake Powell. Black Crappie are a species of sunfish that is very popular in some parts of the United States. However, in Utah, they are less commonly sought after. They are a beautiful panfish that inhabit several Utah	waters, including Utah Lake, Pineview Reservoir, and Lake Powell. Statewide bag and possession limit: 50 fish. Make sure to check the current fishing proclamation for provisions on specific waters before you head out.